The stump-tailed macaque (Macaca arctoides), also called the bear macaque, is a species of macaque found in South Asia. In India, it is found in south of the Brahmaputra River, in the northeastern part of the country. Its range in India extends from Assam and Meghalaya to eastern Arunachal Pradesh, Nagaland, Manipur, Mizoram and Tripura. The stump-tailed macaque has long, thick, dark brown fur covering its body, but its face and its short tail, which measures between 32 and 69mm, are hairless. Infants are born white and darken as they mature. As they age, their bright pink or red faces darken to brown or nearly black and lose most of their hair. Males are larger than females, measuring 51.7–65 cm long and weighing 9.7-10.2 kg, while females measure 48.5-58.5 cm and weigh 7.5-9.1 kg. Males' canine teeth, which are important for establishing dominance within social groups, are more elongated than those of the females. Like all macaques, this species has cheek pouches to store food for short periods of time. This Old World monkey travels quadrupedally, usually on the ground, as it is not very agile in trees. It is generally found in subtropical and tropical broadleaf evergreen forests, in different elevations depending on the amount of rainfall in the area. It depends on rainforests for food and shelter, and is not found in dry forests except where it ranges in the Himalayan region of India, only spending time in secondary forests if it is bordering primary tropical forests. With its thick fur, the stump-tailed macaque can live in cold climates, up to 4,000 meters. It is distributed from northeastern India and southern China into the northwest tip of West Malaysia on the Malay Peninsula. It is also found in Burma, Thailand, Laos, Cambodia and Vietnam. It is possibly extinct from Bangladesh. Britches – an infant stump-tailed macaque used in sight-deprivation experiments, which was stolen from the laboratory by the Animal Liberation Front. ^ a b Groves, C.P. (2005). Wilson, D.E. ; Reeder, D.M., eds. Mammal Species of the World: A Taxonomic and Geographic Reference (3rd ed.). Baltimore: Johns Hopkins University Press. p. 161. ISBN 0-801-88221-4. OCLC 62265494. ^ a b c Htun, S.; Timmins, R. J.; Boonratana, R. & Das, J. (2008). 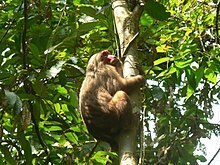 "Macaca arctoides". The IUCN Red List of Threatened Species. IUCN. 2008: e.T12548A3354519. doi:10.2305/IUCN.UK.2008.RLTS.T12548A3354519.en. Retrieved 13 January 2018. ^ Choudhury, A.U. (1988) Priority ratings for conservation of Indian primates. Oryx 22: 89-94. ^ Choudhury, A.U. (2002) Status and conservation of the stump-tailed macaque Macaca arctoides in India. Primate Report 63: 63-72. ^ a b c d e f g h i j k l m n Cawthon Lang KA (2005-10-04). "Primate Factsheets: Stump-tailed macaque (Macaca arctoides) Taxonomy, Morphology, & Ecology". Retrieved 2008-04-17. ^ Felix, Dr. Jiri. 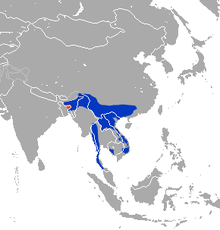 "Animals of Asia". London: Hamlyn Publishing Group, 1983. ^ Mondragon-Ceballos, R; Granados, Garcia; Matamoros, Trejo; Hernandez, Lopez (2017). "Annual Variations in sexual hormones and births' frequency in female stump-tailed macaques". ScienceDirect. This page was last edited on 15 April 2019, at 04:57 (UTC).